01. We are the main outlet for Springbank distillers in England. At Springbank, 100 per cent of production is done on site. In the last 10 years or so, it’s more than doubled in size—but without overdoing it. They’re never going to go into mass production. Our customers want an aged product, and everything that comes with that. 02. Vintages are disappearing. They were always at the top end of the market, but now they’re supremely priced because of the scarcity—they can cost a lot of money for something that’s not necessarily that interesting. You can get really amazing tasting whiskies at five, six, eight years old, and the price point is usually quite reasonable. 03. By law, you have to age scotch whisky for a minimum of three years and it’s got to be done in a reused spirit or wine cask. One of my favourite types is done in bourbon wood. It’s just beautiful—you get a really nice balance of creamy vanillas, oaky notes, and your distil really comes through, it’s not overly dominated by the wood. 04. Young people today are much more willing to experiment, rather than just drinking to get slaughtered, though you wouldn’t think it if you believed some of the red-top media. 05. I tend to add a tiny bit of water to whisky. You can buy water droppers—don’t take them to the pub, it looks very dodgy—which allow you to put literally one drop in. It changes the flavour profile greatly. 06. We could have you arrested for putting ice cubes in whisky. It just tastes of cold. To get the flavour, you need it at room temperature. 07. We don’t chill-filter our whisky. To maintain consistency, the mass market often chill-filters it to take the proteins and oils out, so it doesn’t go cloudy. Then they add caramel to replace the colour. It doesn’t kill the whisky, but it’s an unnecessary layer. 08. 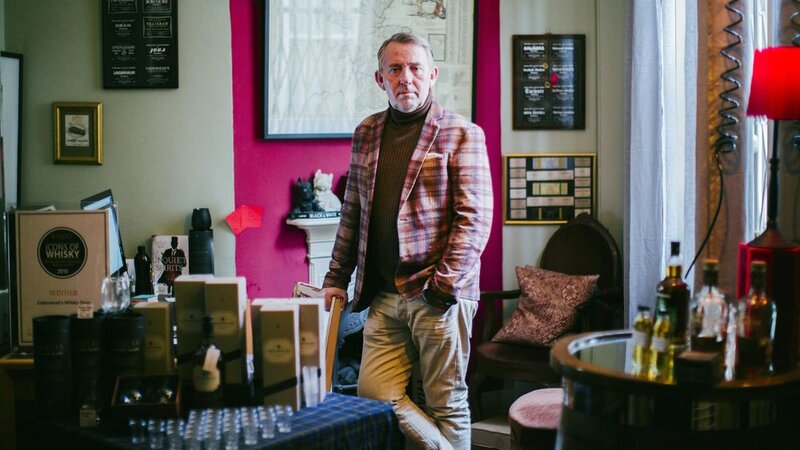 I don’t want to sell a £5,000 bottle of whisky—that’s not really my market. I sell whisky that people want to drink. It’s not a museum, it’s a shop. 09. I worked in the fashion industry for years and years, at various companies. But it got to the stage that people weren’t people, they were just units. And I went, right, I’m off. 10. You need to try the Marylebone Gin. Oh my god, it’s fantastic. We don’t normally carry other people’s gins, but it’s so good we’re going to carry that. With ice and a slice of cucumber, it’s heaven. 12. My absolute favourite whisky is Springbank 15. It’s my desert island whisky. Though there have been some whiskies released for our 175th anniversary that make that decision harder. 13. Like every 15-year-old back in the late seventies, I used to go to bars in Liverpool and get away with buying whisky and soda. But I never got drunk on it. For me, alcohol has always been a sociable thing: you sit with friends, talk. I’ve spent many a night drinking, putting the world to rights. It’s a relaxing thing. 14. You don’t often get 175-year-old businesses. Why has Cadenhead’s endured? I think it’s the mixture of quality and good, old-fashioned determination not to change.